In the spring I spent several days in Constantinople which is known today as Istanbul. On May 28 I walked all the way around the walls to reconstruct the siege of the city in my mind. Then on the following morning I was up at 6 a.m. which is the time when the Muslims poured into the city and panic spread throughout the population. Then at 8 a.m. on May 29, 562 years to the day of the event, I went to Hagia Sophia to remember that morning when the Muslims battered down the Imperial doors to the great church. I spent the entire morning and early afternoon at Hagia Sophia so acutely aware I was in Constantinople on the anniversary of some eventful days. On May 27 Mehmet ordered the heaviest bombardment of the city. On May 28 the Muslims were given over to prayer, fasting during daylight and ritual ablutions. With candle illumination at night, the city was ringed with fire for the next two nights while the muslims chanted the names of God to beating drums and clashing of cymbals. The people in the city prayed and did penance. In contrast to the silence, the city was filled with bells, and prayers reached a crescendo the morning of the 28th. Every icon and relic came to Hagia Sophia and there was a procession the full length of the land wall. There were only 4000 soldiers left. In the afternoon at Hagia Sophia. Catholic and Orthodox alike prayed in union and they set aside the 400 year old schism and shared Communion. And the women and children stayed all night in vigil. At nightfall the Muslims broke the fast and massive bombardment began in the night. At midnight the Muslim camp was silent waiting for the order. 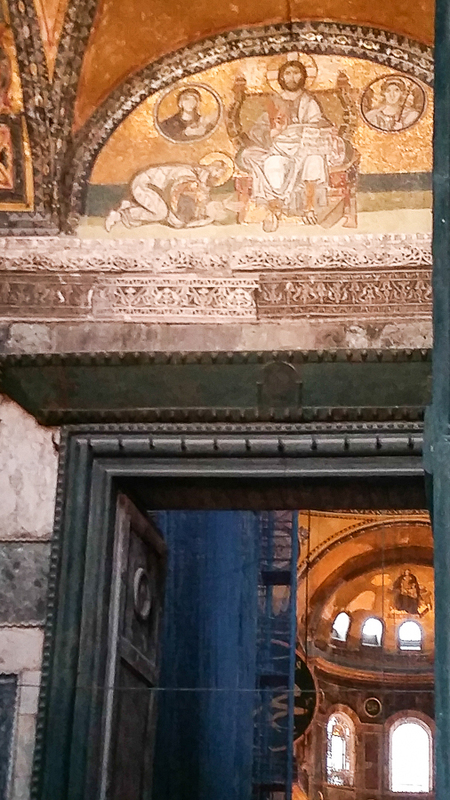 Mosaic of Christ, over the Imperial door. Hagia Sophia. Returning from a raid one of the Italians forgot to lock the postern and some of the Ottomans spotted the open door and at 1:30 a.m. on May 29 they burst in, killed the soldiers, took down the flag of Saint Mark and raised the flag of Islam. Within five hours at dawn the Muslim soldiers were beheading the dead and the dying and by 6 a.m. there was indiscriminate killing everywhere. 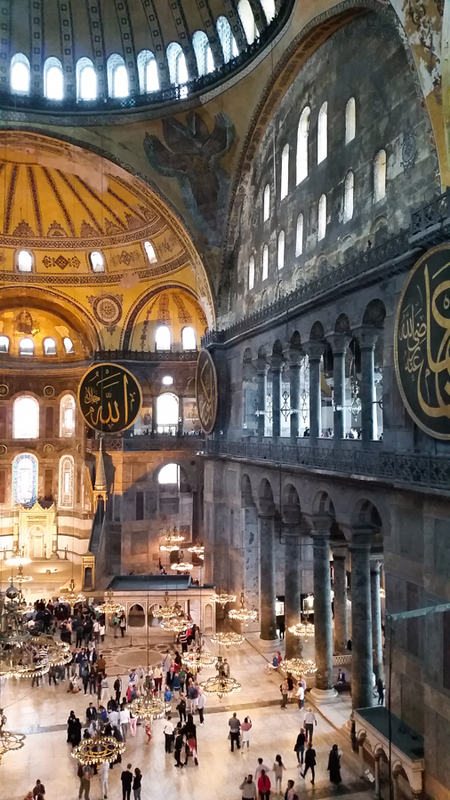 The faithful fled to Hagia Sophia inspired by the prophecy the avenging angel would drive out the invaders. The bronze doors shut at 8 a.m. They prayed for a miracle. The Janissaries battered down the imperial doors. As I stood at the door today I looked up and saw the mosaic of Jesus which witnessed this. Within an hour the congregation was bound up and led out and then the Muslims hacked the valuables up. The church was left desolate. Later in the day, Mehmet arrived at the church. He dismounted and poured dust on his head as a sign of humility. Then he called an imam to go up into the pulpit and recite the call to prayer. So early afternoon when I was leaving the church I heard the call to prayer from the outside penetrating the inside and all these thoughts rushed into my mind. He achieved his dream, yet already stared over the edge of his own decline. I continued to look up, and imagined the evening of 29 May when the evening sun illuminated the smashed icons and mosaics strewn in pools of dry blood. This entry was posted in Christianity, Islam, Persecution, Silk Road, Travel and tagged Constantinople, Hagia Sophia, Mehmet on September 20, 2015 by frjfkauffmann.